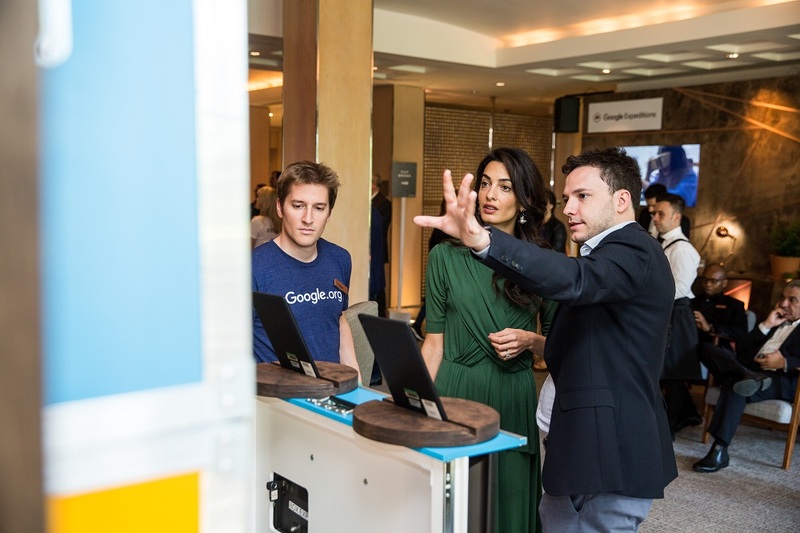 For ten years now, Google Zeitgeist, an annual European conference organized by Google in London has been bringing together its top brass, partners, celebrities and speakers. A series of lectures is dedicated to world events. The event also shows off new products developed by Google as well as the innovative philanthropic initiatives that they support. LWB’s Ideas Box is part of these social impact innovations supported by Google and Google.org. Thanks to the Google Impact Challenge France, LWB has the means to develop and deploy a new version of the Ideas Box. The support provided by Google.org also has allowed us to implement several Ideas Boxes for refugees in Europe, most notably in Greece. The Ideas Box therefore had its own spot at Google Zeitgeist, during which the issue of the refugee crisis not only in Europe but also in the Middle-East, was discussed. Cate Blanchett, actress and UNHCR Goodwill ambassador, and Amal Clooney, renowned human rights lawyer, were there to advocate for the refugee cause. They were also very interested by the concept of the Ideas Box and its role in providing access to information and education to some of the most vulnerable populations around the world. Cate Blanchett had already had the chance to see the Ideas Box in action with Syrian refugees in the Azraq camp in Jordan. Amal Clooney exchanged with Jérémy Lachal, the Executive Director of LWB France, about the refugee crisis in Lebanon, to which she has a personal connection, and about legal support for migrants coming to Europe. Jérémy Lachal, Directeur général de BSF, présente le potentiel de l'Ideas Box à Amal Clooney. © Google.